Abadian, K., Keshavarz, Z., Mojab, F., Alavi Majd, H., Abbasi Nazari, M. (2016). The Effect of Teucrium Polium on the pain duration of Dysmenorrhea, The Placebo Controlled Randomized Clinical Trial. Journal of Applied Biotechnology Reports, 3(1), 383-386. Khadige Abadian; Zohre Keshavarz; Faraz Mojab; Hamid Alavi Majd; Mohamad Abbasi Nazari. "The Effect of Teucrium Polium on the pain duration of Dysmenorrhea, The Placebo Controlled Randomized Clinical Trial". 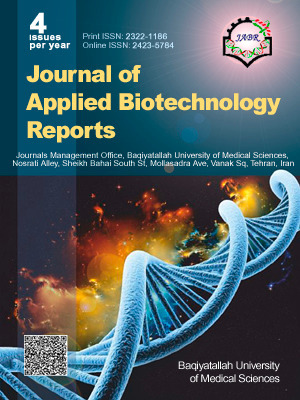 Journal of Applied Biotechnology Reports, 3, 1, 2016, 383-386. Abadian, K., Keshavarz, Z., Mojab, F., Alavi Majd, H., Abbasi Nazari, M. (2016). 'The Effect of Teucrium Polium on the pain duration of Dysmenorrhea, The Placebo Controlled Randomized Clinical Trial', Journal of Applied Biotechnology Reports, 3(1), pp. 383-386. Abadian, K., Keshavarz, Z., Mojab, F., Alavi Majd, H., Abbasi Nazari, M. The Effect of Teucrium Polium on the pain duration of Dysmenorrhea, The Placebo Controlled Randomized Clinical Trial. Journal of Applied Biotechnology Reports, 2016; 3(1): 383-386. Primary dysmenorrhea is a prevalent problem and its effects decrease the quality of life in many women across the world. Due to the side-effects of synthetic drugs, there is an increasing trend toward herbal medicine. The aim of this study was to research the effect of Teucrium Polium compared to placebo on the pain duration of Dysmenorrhea. This triple-blind, randomized, clinical trial study was performed on 70 single female students between 20 and 30 years old educating in Shahid Beheshti University (Tehran, Iran) from October 2014 to February2014 .They were allocated randomly into two groups: In Teucrium Polium group (n =35) who took 250 mg of Teucrium Polium powder q6h for the first 3 days of menstruation for two cycles. The second group (pelacebo) (n=35) received 250 mg starch powder. The pain duration of Dysmenorrhea was determined by visual analog scale (VAS) and questionnaire related to the pain duration. Based on results, there were no differences between two groups for demographic or descriptive variables. Comprising the pain duration showed that the participants in Teucrium Polium groups had lower significant pain in the 1st and the 2nd months after the treatment (P < 0.001) but in pelacebo group, there was not any significant decrease in the pain duration. No side effects were reported in the Teucrium Polium and pelacebo groups. Results showed that Teucrium Polium can be effective in decreasing the pain duration in primary dysmenorrhea. Charu, S., R. Amita, Sujoy, R., Thomas, G.A., (dysmenorrhea on quality of life of medical students). Int j collab res internal med public health, 2012, Vol. 4, pp. 276-294. Hsu, C.S., J. K. Yang , Yang, L.L., "Effect of a dysmenorrhea chinese medicinal prescription on uterus contractility in vitro. Phytother Res, 2003, Vol. 17, pp. 778-783. Berek, J.s., Berek&Novak gynocology.15th ed, in.2012, Lippncott Williams & Wilkins. Phiadelphia:147-484: Phiadelphia. p. 147-484. Fritz, M.A., L.Speroff, Clinical Gynecology Endocrinology and Infertility. 8th ed. Lippincott Williams&Wilkns. 2011, pp. 200-580. Ju, H., Jones, M., Mishra, G., The prevalence and risk factors of dysmenorrhea. Epidemiol Rev, 2013, Vol. 9, pp. 12-27. Modarres, M., Ali, M.M., Oshrieh, Z., Mehran, A., Comparison of the effect of Mefenamic Acid and Matricaria Camomilla capsules on primary dysmenorrhea. Babol Uni Med Sci J, 1390, vol. 13(3), pp. 50-58. Nejad, V.M., Asadipour, M., Comparison of the effectiveness of fennel and mefenamic acid on pain intensity in dysmenorrhoea. ‎East Mediterr Health J, 2006, Vol. 12, pp. 423-428. Cunningham, C.J., Weathington, B.L., Pittenger, D.J., Understanding and Conducting Research in the Health Sciences, John Wiley & Sons. 2013, pp. 45-60. Younesy, S., Amiraliakbari, S., Esmaeili, S., Alavimajd, H., Nouraei, S., Effects of fenugreek seed on the severity and systemic symptoms of Dysmenorrhea. J Reprod Infertil, 2014, Vol. 15, pp. 41-45. Mirabi, P., Effect of valerian on systematic manifestation of menstruation. J Med Plant, 1391, Vol. 11, pp. 155-163. Gharib naseri, M., Omidi birghani, F., Antispasmodic effect of Teucrium polium leaf extract on rat ileum. Pejohande, 2007, Vol. 12(1), pp. 59-67. Lagow, B., al, e., eds. PDR (Herbal Medicines) The information standard for complementary medicin. 3th edition. 2004, Thomson PDR at montvale, NJ07645-1742. 649-650. Baharmaleki, S., Yazdanparast, R., Phytochemistry and medical properties of Teucrium Polium. Phytother Res, 2012, Vol. 26(11), pp. 1581-1593. Rafieian, M., Teucrium Polium, liver and kidney effects. J Red Mrd Sci, 2014, Vol. 19(5), pp. 478-479. Gharib Naseri, M.K., Omidi, B.F., Vakilzade, G., Spasmolytic effect of Teucrium polium on virgin rat uterus Iran J Basic Med Sci, 2005, Vol. 8, pp. 31-36. Phipps, W., Medical surgical nursing health and ILLNESS prespectives. 2003: St Louis, Mosbey. Allahtavakoli, M., Moradi, R., Shamsi, S., Afsharmanesh, K., Effect of hydro-alcoholic extract of Teucrium polium on castor oil-induced diarrhea in male rat. Zahedan J Res Med Sci, 2013, Vol. 15, pp. 54-57. Shahraki, M., Mirshekari, H., Palan, M., Paper: The comrerison of noclceptive effect of Teucrium polium and morphine in female rats. Ofogh-e-danesh 2006, Vol. 12, pp. 10-13. Satarzade, N., Effect of Achillea millefolium on duration of pain and menstrual bleeding. Tabriz Nurs Midwifery J, 1378, Vol. 12, pp. 4-10. Abadian, K., Keshavarz, Z., Mojab, F., Majd, H.A., Abbasi, N.M., Comparison the effect of mefenamic acid and Teucrium polium on the severity and systemic symptoms of dysmenorrhea. Complement Ther Clin Pract, 2016, Vol. 22, pp. 12-15.